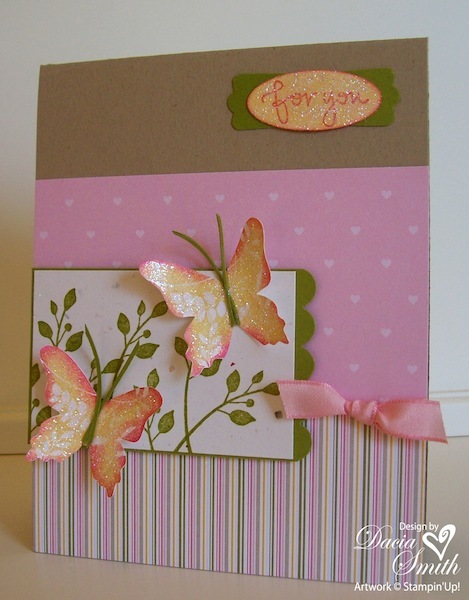 The featured card is compliments of a sweet talented stamper, Ashley Childers of Winston-Salem, North Carolina. She’ll help you put this one together on Saturday, February 27 from 10:00 am until 1:00 pm at 5000 Country Club Road, Winston-Salem NC. Wouldn’t you like to join her? 1. 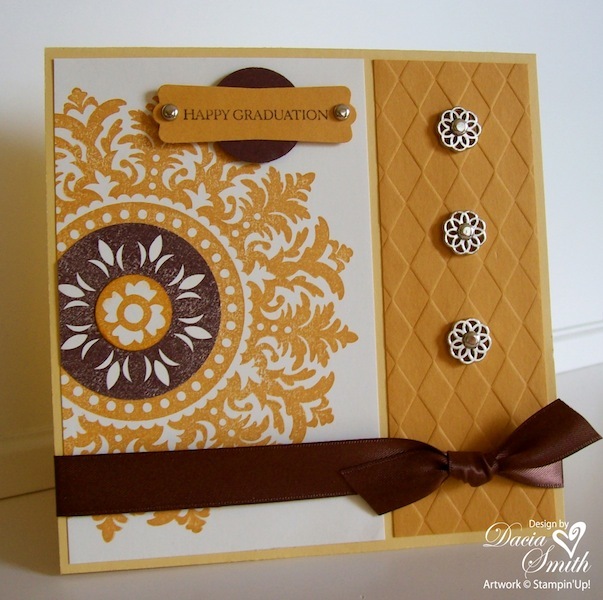 The texture on the Kraft panel was achieved with the Very Vintage Wheel and a Close to Cocoa Classic Stampin’ Pad. 2. The bloom from Vintage Vogue fits nicely in the 1″ Circle Punch for a quick layered look. 3. The sentiment from Well Scripted was a perfect finishing touch for this special Mother’s Day card. I’m sure there are many soldiers who would love to send this one back home. The Occasions Mini Catalog is full of wonderful stamp choices for all of your spring holiday needs. The last several days have been busy. The Stampin’ for Soldiers event is this weekend and I’ve been working on the final details. It’s going to be a great week and I can hardly wait for Saturday. Wow! Life is so much easier with the Big Shot and Sale-A-Bration goodies. 1. 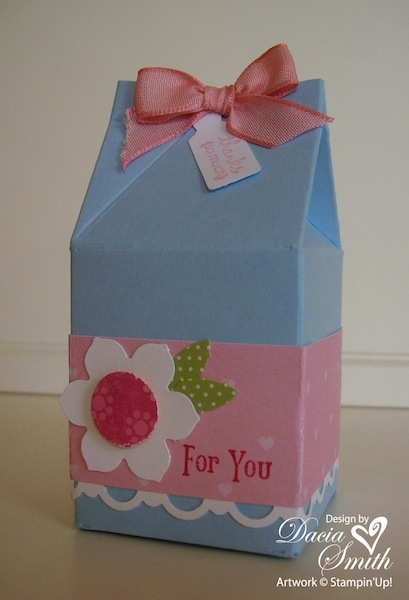 The Big Shot Mini Milk Carton Die is a great tool for creating cute place setting favors to share a special treat with friends. Especially when you need 75 in a short period of time. Cutting and scoring would have taken 3 times longer working on my own. 2. The bloom is a cinch with the 1/2″ Circle Punch, the Birds & Blooms Die, and the Eggcellent Eggs Kit. The perfect accent to a cute project. 3. The Welcome Neighbor Designer Series Paper Pad is full of beautiful spring patterns to adorn any sweet favor. The Scallop Trim Border Punch adds a little dainty lace trim to the fabulous paper selection. The final detail is the perfect sentiment found in the Vintage Labels stamp set. Best tip of the day, all are free with a qualifying order during Sale-A-Bration. 4. What project would be quite complete without a little Pretty in Pink Taffeta Ribbon bow? I used the Piercing Tool and tied this one on lickety split. 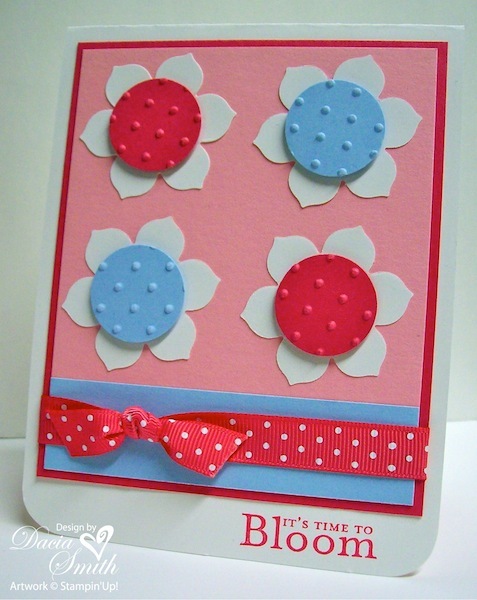 This is one of the 10 cards we will create at the Stampin’ for Soldiers event on February 27. We have committed to 1000 Mother’s Day cards for the troops serving our country abroad. We are forwarding them to Martie Shea of “From Our Hearts” who will distribute to military chaplains overseas. Would you like to stamp a card for a soldier? Come join us or stamp one at home and forward to me by February 27. 1. 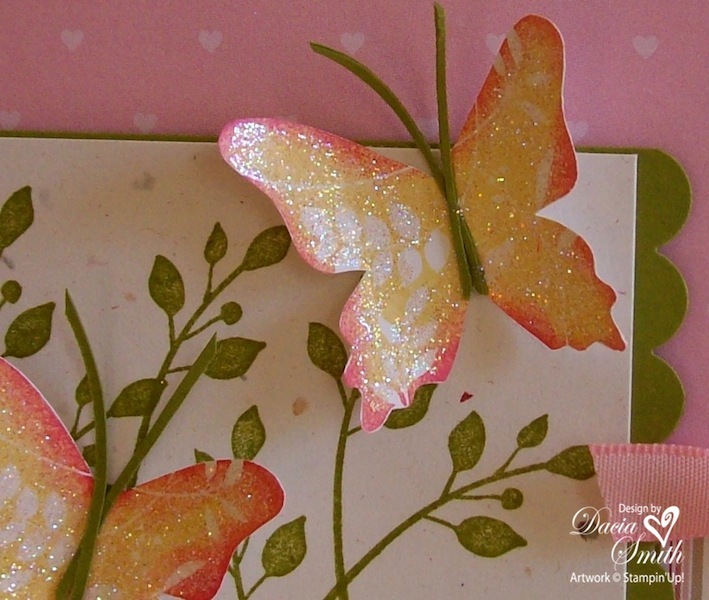 With the help of the Big Shot and the Birds and Blooms Die this one will be a quick easy card to assemble. 2. Just look at those matching polka dots with the Perfect Polka Dots Impressions Folder and the Melon Mambo Polka-Dot Grosgrain Ribbon. Aren’t they the cutest? I just love matching things! 3. The sentiment is compliments of Bella’s Bloom, another free set for a qualifying order during Sale-A-Bration. Answering the Color Challenge over at Stacey’s Stamping Stage with a case of the very talented Mary Fish. 1. 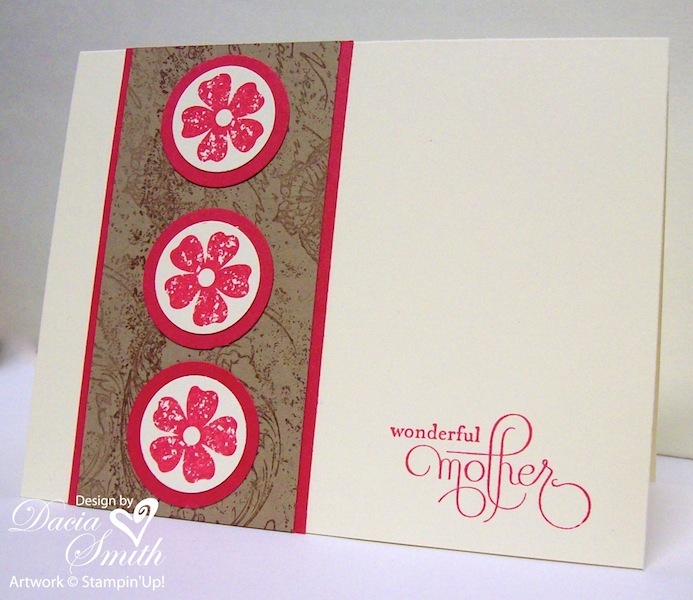 The texture on the More Mustard Card Stock was achieved using the Backgrounds 1 Texturz Plates from Stampin’ Up! 2. The Medallion Background was stamped several times and punched. The layering of color adds interest and balance to the design. 3. The Filigree Brads counted as my going gray. Getting a jump start on some graduation cards. I have several friends and family graduating this year. 1. The stamped sentiment is mounted to a Medium Window Sheet that lifts to reveal the inside message. 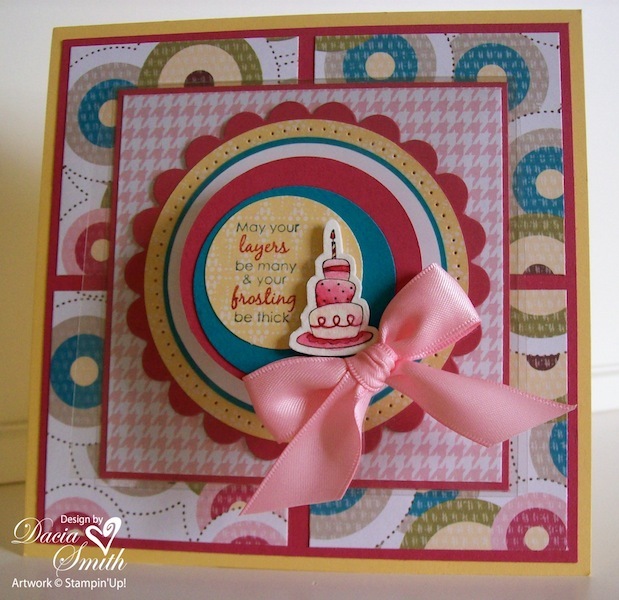 The idea plays off of the layers message of the Birthday Bliss stamped image. Another favorite that could be yours for a $50.00 order during Sale-A-Bration. 2. Making perfect circles has never been simpler with the aid of the Circle Scissor Plus. The card includes six layered circles in various sizes. Three on the inside and three on the outside. 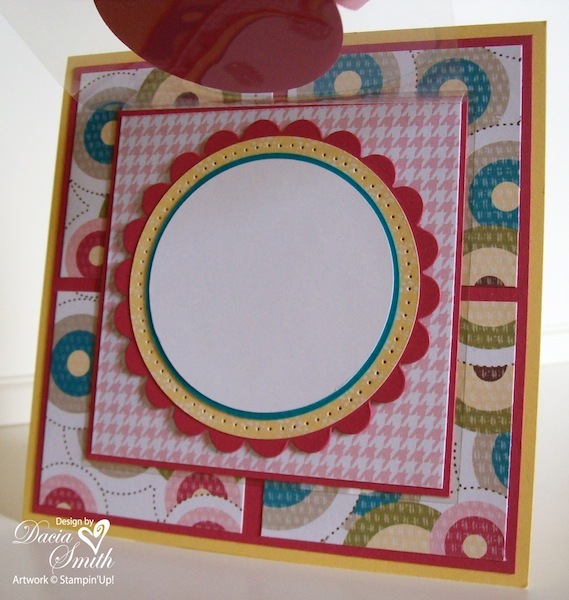 Another play off of the circle pattern within the Sweet Pea Designer Series Paper. 3. 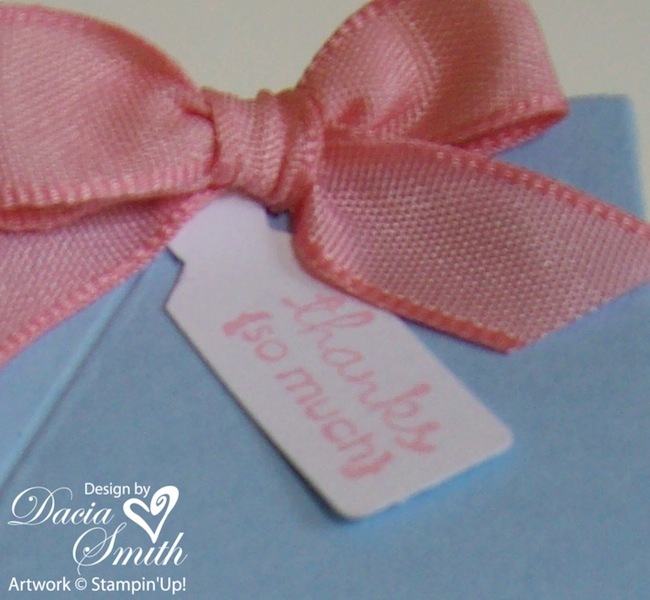 The Pretty in Pink Satin Ribbon bow attached to the outside with a Mini Glue Dot is just the right finishing touch. 1. The Rock-n-Roll technique was used to create the multicolor effect on the butterflies. After applying a little Dazzling Diamonds they were cut out with Paper Snips and attached with Mini Glue Dots. The sentiment was created to match, completing the number three for a balanced design. 2. The Modern Label Punch was snipped in half and overlapped on the back to create the layered sentiment. 3. 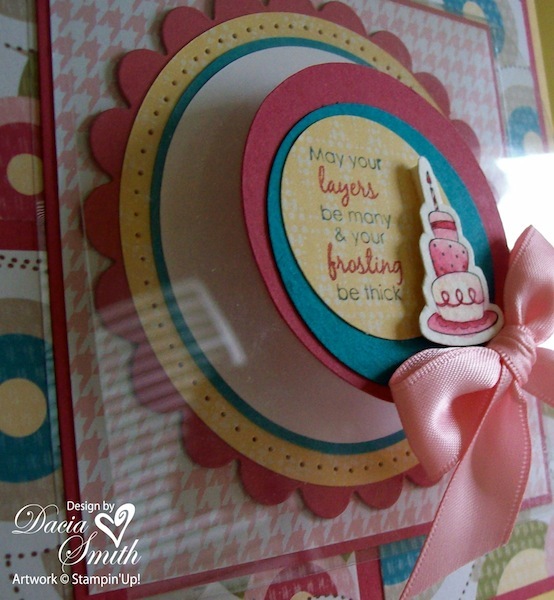 The soft spring color palette was compliments of the Welcome Neighbor Designer Series Paper Pad. 1. 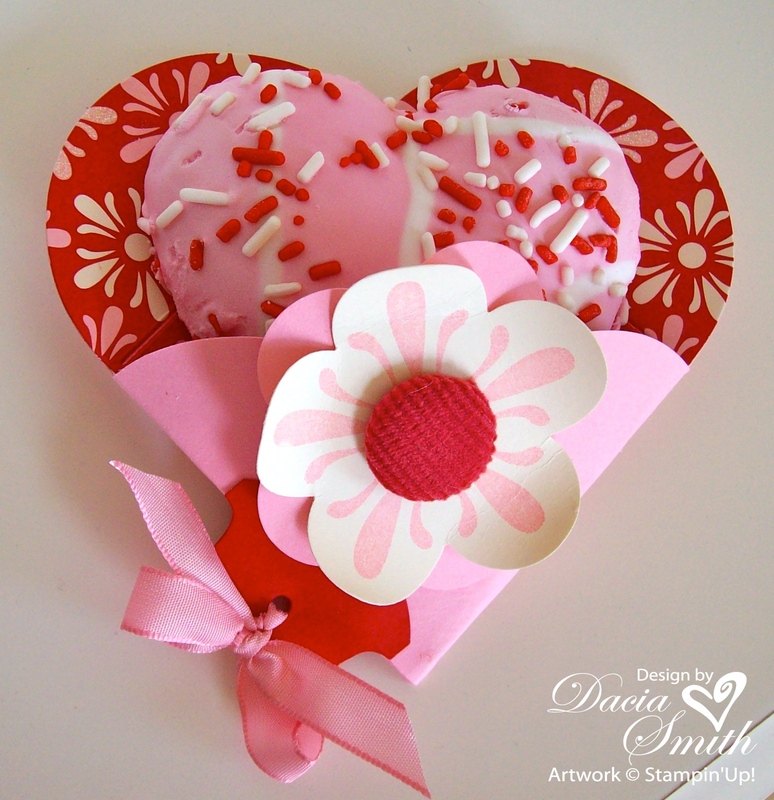 After enjoying the delicious treat who would want to throw away the beautiful container made with the Petal Card Die? Well this one is a keeper because it doubles as a bookmark. Just spin around and place it over the page corner of your favorite read. No more ratty turned down pages for you. The Round Tab Punch added to the bottom left side doubles as a handy gripper to move from page to page. 2. 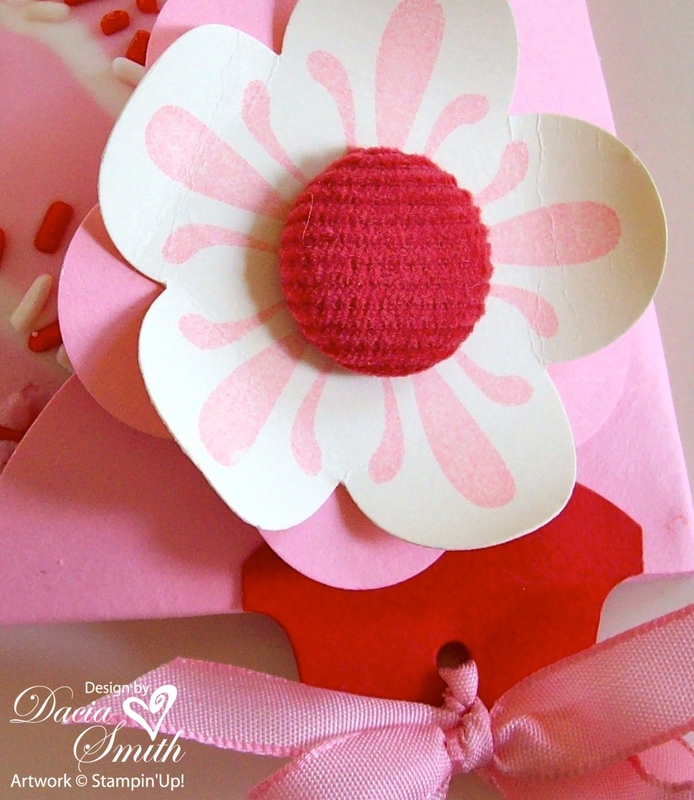 The Extra Large Fancy Flower Punch helped to create the perfect matching embellishment to adorn the project. The flower was attached with a Real Red Corduroy Brad that also held the container together. 3. The finishing touch was a Pretty in Pink Taffeta Ribbon bow. Punch a 1/8″ hole in the tab with your Crop-A-Dile and thread in a piece of ribbon and tie. No project is quite complete without a little ribbon for a bow.